It would have been a big shame on the heritage of Kunle Afolayan if he is not making the kind of impact he is making right now in Nigeria movie industry otherwise known as Nollywood. You need to know where the banker-turned filmmaker is coming from to understand the issue at stake. 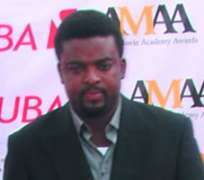 Kunle hails from the family of legendry film maker, Ade Love. Ade love is among the earliest fore-fathers of the Nigeria movie industry. When Kunle quit banking in 2005 to face movie making fully, not a few people wondered if the tall, lanky dude will live up to his heritage. Prior to that time, he had appeared in a number of home videos. Of particular mention among them is his role as Arese in Saworo Ide, a movie by legendry cinematographer Tunde Kelani who incidentally, is one of his mentors. Kunle has emerged from the crowd and is currently causing a ripple that will last for sometime to come. His first movie, Irapada was released into the market recently and it sold about 50 000 copies in just three weeks. Those who know about the dismissal performance permeating movie marketing know that is a feat. The movie has taken him all over the world and it has been on major festival worth its salt. Afolayan dazed all when he got former governor of Lagos State, Bola Ahned Tinubu attend the premier of his movie in lagos within four days. From the little Arese Kunle has grown to be a man of his own. He recently directed an all-white-cast movie in Hollywood, USA where he was paid in hard currency. Well it's not really a Yoruba movie; I'll like to correct that. It is a Nigerian film with a Yoruba title. For me as a professional film maker, a film doesn't have a language. Content is the key, it's very important, its one of the most important aspect of the film. It's not about taking movie to all festivals all over the world. I didn't beg them to put my film. They searched for good films around and Irapada happens to be one of those films selected from Nigeria. Well, the first one is actually an experiment. It's the least of what we are going to do. We're already working on the next one and I believe that's going to go farther than Irapada. I'm an upcoming film maker and I have mentors like Tunde Kilani, Tade Ogidan and a few others. And having seen what they've been able to do, I look for the lapses that occur in their work and I try to work on that, project it and see how far it can go. Tunde Kelani is someone who doesn't compromise quality as regards films, but in the business terms of the making, he's not doing too well because he believes so much in creativity and cares less about money. I'm a young man that needs money. So what I do is, I combine creativity with the business sense and I put it together and that has kept me moving. I also don't want to do anything that'll affect the image I've been able to build. So, Irapada is just the beginning of good things to come. It was shot on HDD. We didn't shoot on 35mm, yet it was perfect because we actually employed creative techniques. We did our sound and colour and all that painstakingly. It is not about shooting on 35mm. a lot of people don't understand the meaning of format. 35milimetre is a size of frame, 16milimetre is a size. But there's what you call digital format. There are so many Hollywood films shot on digitals and they go to festivals all over the world. I can shoot with a phone with good lightning and it will go to any film festival. So, it's not about 35mm and all those formats. It's about you applying the right technicalities. It's about you doing the right thing, that's what qualifies you for the festival. I have gained a lot of things. I have also been able to shoot in Hollywood. I had an entire white cast and I directed the whole thing. It was an 'Oyinbo' film and an 'Oyinbo' story. It was also shot on 16mm film. It was screened on the day of the premiere. People really liked it and I'm going to find a way of putting it on TV so that everybody can see it. The title is The Figurine. Irapada is owned by my company and I own my company. I run a production outfit where we rent out gadgets and I'm also into events. A lot of people did not believe that I gave him the invitation four days before the event. I gave it to him and he said he was going to come, and he came. I don't know yet because I've not received it. How much did he promise? He didn't mention any amount, he only promised to do something. I've got children. I've got kids and I'm married to a woman. I never get drunk. I'm a responsible drinker. I work so hard and I can spend my money on anything I want. We do see. I've been to America for four times and we saw those four times. I think it's the way forward and we should embrace it. Those who shy away from it are actually greedy. Independent film makers will support that course because it's going to protect independent film makers.